We invite original contributions as research papers, panel proposals, Work-in-Progress talks, pre-conference workshop proposals, and demo proposals. All papers are evaluated through a double-blind peer-review process, and those accepted will be published in printed proceedings by Elsevier. During the Work-in-Progress (WiP) session participants give short presentations on ongoing work, recent results, and other topics of interest to the audience. Presenters may sign up for a 5 minute slot during the conference. in Adobe Acrobat PDF format. Papers are limited to 10 pages in two-column format, 10 pt. Accepted papers will be required to be resubmitted to the publisher in editable source format (Microsoft Word, Latex, or plain text) for final print formatting. Panel submissions must be e-mailed to dfrws2009-panels (at) dfrws (dot) org in PDF or plain text format. 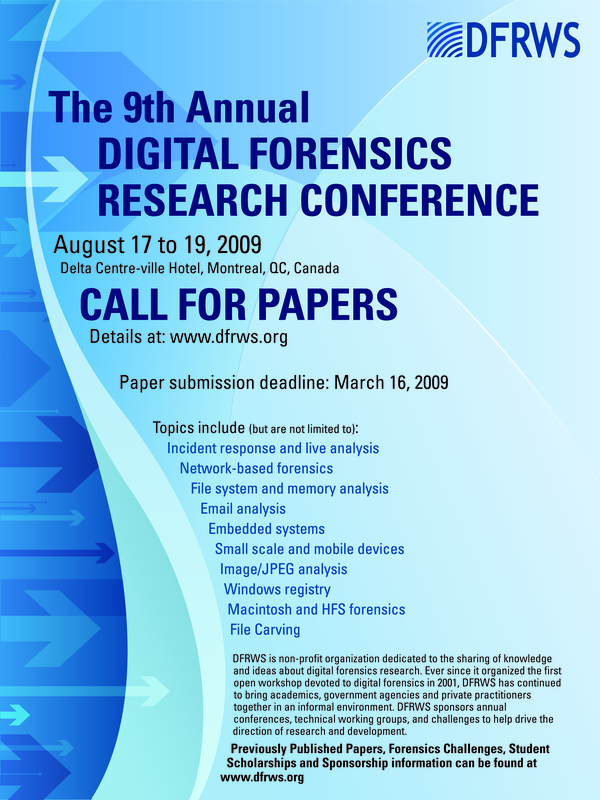 Poster and demo submissions must be emailed to dfrws2009-demos (at) dfrws (dot) org in PDF or plain text format. Proposals for pre-conference workshops must be emailed to dfrws2009-workshops (at) dfrws (dot) org in PDF or plain text format. A limited number of scholarships may be awarded to students presenting a paper at the conference. The intent is to help alleviate the financial burden due to the cost of hotel expenses and conference registration. Full details are posted on the DFRWS 2009 conference website: http://www.dfrws.org/2009/.